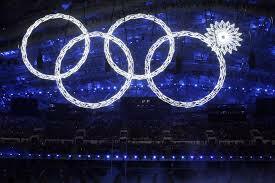 Olympic Ceremony Rings Malfunction, Symbolic? They say nothing is a coincidence. So there must be a message for the world coming out of the Opening Ceremony of the Winter Olympics from Sochi in Russia after a critical and symbolic moment in the opening spectacular went wrong. What began as five snowflakes was supposed to morph, like spirograph patterns, into the Olympic Symbol – the five rings – which represent the five continents of our planet. But only four metamophised as they were intended. The ‘message’ I got was that one continent (or group of people) has moved out of alignment or has moved ‘on’ or ‘up’ from the others. I felt it was something very, very positive. I naturally thought I would find out who it was by researching my old Olympic files. Ironically, though, none of the actual rings represent any particular continent; rather, at least one or more of the five ring colours are contained the flags of every country around the world. So what did the red one not coming on line mean? Well red is the color of fire and blood, so it is associated with energy, war, danger, strength, power, determination as well as passion, desire, and love. It is also a very emotionally intense color. It enhances human metabolism, increases respiration rate, and raises blood pressure. It has very high visibility, which is why stop signs, stoplights, and fire equipment are usually painted red. In heraldry, red is used to indicate courage. So my take on it was that war and danger are fading. And that much courage has led to this. It also said to me that the Olympics (more especially the organisers,) may have also begun to lose their powerful grip and influence. Nancy: I resonant with Stephen’s interpretation of one ring supposedly malfunctioning … I intuitively feel it was a divine message … in an opening ceremony that was highly technological and flawless except for the one ring. Putin has expelled the dark cabal from Russia. There will be no articles about Satanic and Illuminati symbolism used during this ceremony as there were regarding the London Olympics, the last two Super Bowls, and the recent Grammy Awards.